This series highlights each company in the 2018 class of the Comcast NBCUniversal Accelerator, powered by Techstars. The program kicked off in July and includes 10 companies from around the world building media, entertainment and connectivity companies. Yuting Su wants engaging, educational toys for her two-and-a-half-year-old son, Owen. There’s no doubt that touchscreens will be a big part of his future, but Su — a child of the late 80s — longs for simpler toys that incorporate natural, physical play for her son. While pregnant, Su was working on her master’s in Interactive Media and Games at the University of Southern California. She created educational prototypes like an interactive textbook. Then she had a Eureka moment — create a toy that combines the physical play of a plush stuffed animal with the engaging interactivity of a tablet computer. 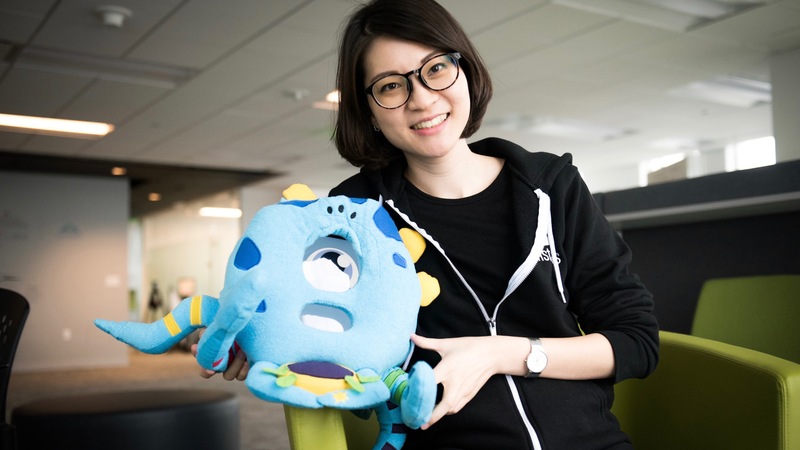 So, Su created Octobo, the first product from her startup Thinker-Tinker. Octobo is a smart plush toy in the shape of an Octopus that incorporates soft sensors, and can sense children’s interactions, thereby providing customized learning and emotional feedback. With a tablet tucked inside, Octobo uses educational apps, adventure storybooks, and physical tokens to encourage children to learn by playing games. Of course, Owen is the company’s chief QA tester. But, disrupting the toy market is no easy task. That’s why Su is spending 13 weeks in Philadelphia for the Comcast NBCUniversal LIFT Labs Accelerator, powered by Techstars. She’s working from Comcast NBCUniversal’s global headquarters, leveraging one-on-one mentoring from experts across Comcast NBCUniversal’s businesses as well as Techstars’ mentors with deep industry, investment, and consumer product experience. Octobo is just the kind of versatile toy parents crave. It’s educational. It’s cuddly. It helps development on many different levels. With the prevalence of digital devices, children aren’t spending enough time developing in the physical world. With a variety of games, Octobo helps to hold a child’s attention as they grow. For preschoolers, it teaches letters, vocabulary, numbers, shapes, colors and patterns. For elementary schoolers and up, it teaches coding, science, technology and mathematics. “This platform can really give you so much in repeat value,” said Su. Building Octobo is complex. It combines hardware, software, children’s stories and plenty more. Incredibly, Thinker-Tinker is run by just Su and one other full-time employee — but they’re enlisting the help of others. “We have book writers, illustrators, hardware designers, plush prototypers, character designers, composers, graphic designers. We bring in a lot of talented people on this project,” said Su. Despite its small team, Thinker-Tinker is resonating with potential buyers. The company has raised more than $56,000 in a successful Kickstarter campaign and was named as an IndieCade 2016 Finalist. Su knows she’s competing with mega-corporations to get her product noticed — and she’s got a simple philosophy to get the job done: courage and curiosity.